The other day I mentioned in one of my articles that Senator Ted Cruz had made the statement that if elected he would try to repeal Obamacare. First of all I was wrong by saying that. What Senator Cruz had said was that he would sign legislation sent to him by Congress which repealed Obamacare. So the Senator was not stating that if elected he would bypass his Constitutional authority as president by unilaterally repealing a law. I just wanted to correct my misunderstanding of what the Senator stated. See, I will admit when I’m wrong unlike many I know. But I’m not quite done yet. You see, I overheard a couple people discussing/arguing, the constitutional legality of Obamacare. Guess my article might have got someone thinking after all. Anyhow, this one person was arguing that it is perfectly legal for the government to force someone to purchase health insurance. I didn’t want to say anything right then and there because an idea began to take shape and I wanted to see where it went before I opened my mouth without fully thinking it through. But here is what I came up with. So some people think that it is within the government’s authority to mandate that I purchase health insurance? Although I can find no constitutional basis for that belief let’s just for a moment pretend that they are correct in their position. I’m not saying they are, I’m just playing devil’s advocate and saying let’s for a moment imagine that what they say is true. If we are gonna play this game let’s just say that the government does have the authority to force you to purchase something you do not want to purchase or else pay a fine, or go to jail. Okay, I’m up for this game, but I have to warn you, you may not like how I play. So to those of you who say that I must purchase health insurance because the government has made it law that I do so, I have something to say. How would you like it if the government passed a law saying that every male in America must purchase a gun? I know for a fact that there are certain women I work with who wouldn’t like that law at all as they have told me, in no unclear terms, that they will not allow their husbands to buy a gun. So how would they like it if owning a gun became a requirement backed by law and enforced by fines and prison time for noncompliance? I’m thinking they would raise holy hell, saying “You can’t force us to buy guns.” Wait a minute though, the government can require that we buy health insurance but they can’t require us to buy guns? How is that fair? You see if you take health insurance out of the picture and just work on the premise that the government can require that you purchase one thing, how is it that you won’t allow them to require you to purchase ANYTHING? If you begin giving the government the authority to tell you what you are required to purchase who knows where this will end up? They could begin telling you what you must eat, what you must read, and what you must listen to. The moment the government begins interfering with your freewill and starts requiring that you do anything against your will you have lost your freedom. You see, what’s at stake here is not whether or not too many people are going around uninsured and placing a burden upon the hospitals and clinics in America, it is the idea that government can force you to do anything. You don’t like the idea that government might require that all males in America purchase a gun? Well I don’t like the idea of government telling me I MUST purchase health insurance. It should be my choice as to whether I purchase it or not. Sure I understand that our health care system has made it so that some people cannot afford health insurance, and yes, maybe something could be done by government to reign in the costs of health care so it is affordable. But to make it a law that those who may not want health insurance must buy it or else goes against everything that I believe our government was established to be. Also, if you put aside the Supreme Court’s twisted interpretation of the taxing and commerce clause of the Constitution, I find no legal and historical background to justify Obamacare. That is not the case however with requiring that all males own a gun. Have you ever heard of a militia? You’ve heard me harp endlessly about the 2nd Amendment and my right to keep and bear arms. Yet for all my talk I have primarily kept my comments on only part of the Second Amendment. You see, there is another part that I have not addressed. The Second Amendment also says, “A well regulated militia, being necessary to the security of a free state…shall not be infringed.” You see, the Second Amendment not only protects our right to keep and bear arms, it also protects our right to form militias. In fact within the body of the Constitution itself the militia is mentioned numerous times. Can you say the same thing about health insurance? It wouldn’t surprise me if the only knowledge you have regarding militias are what you may hear on the news. More often than not they are painted as extremist anti-government groups who pose some sort of terrorist threat to society. That is not true. Our Founders believed that an army of men, comprised of the people, was the best means of defense against tyranny. They loathed the idea of standing armies that could be used by government to impose its will upon the people. Bet you didn’t know that within the Constitution there is a clause which states that the longest time any appropriation of funds for an army is two years. They did so to prevent a perpetual army that could be used as enforcers of tyrannical laws against the people. You see, Thomas Jefferson once said that, “The constitutions of most of our States assert that all power is inherent in the people; that…it is their right and duty to be at all times armed…” That right there is at the crux of what a militia is, an armed populace, ready at a moment’s notice to take up arms and defend their freedom…from whomever. That is why all oaths of loyalty to the Constitution state that those taking them defend it against all enemies, both foreign and domestic. But you say we no longer have a militia, or even the need for one. Are you sure about that, or is that what you think, or have heard? When has it even been considered that a free people must give up their right to defend their freedom and transfer that right to another body of men? You may ask then, what is the militia? Well in a 1788 speech in Virginia George Mason both asked and answered that very question. In his speech to the Virginia Assembly Mason said, “I ask, Sir, what is the militia? It is the whole people.” The militia is everyone, and just because it is not active today does not mean it does not exist. It is just that it is dormant. So like it or not, if you are 17 or older, you are part of the militia of the United States. That does not mean that you are going to be called into service and sent abroad to fight our countries seemingly endless wars. No, the sole purpose of the militia is to protect America and the freedom this country stands for. That is, as Jefferson stated, your duty. No, for the most part members of the militia are supposed to provide their own arms when called into service. In fact, and I bet you didn’t know this either, in 1792 Congress passed a law entitled The Militia Act of 1792. In it was a requirement that every citizen enrolled in the militia provide themselves with a musket, a bayonet, a belt, two spare flints, a cartridge box with 24 bullets, and a knapsack. If you owned a rifle you were required to provide a powder horn, 1/4 lb of gunpowder, 20 rifle balls, (bullets), a shooting pouch, and a knapsack. You see, militia members were required by law to be armed and ready to go at a moment’s notice. You often hear the term minutemen in regards to our country’s history. 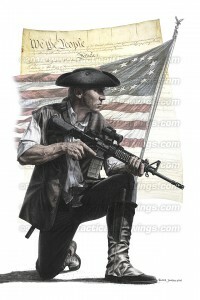 Minutemen refers to the ability of men to be ready to go off and fight at a minute’s notice. That was the law, and even though there are few well regulated militias in existence today, the law still stands that all able bodied males over the age of 17 are part of the militia of the United States. So, getting back to my initial point, you may believe that the government has the right to mandate that people purchase health insurance. I find no Constitutional or historical evidence to support that claim. On the other hand I find ample evidence to support my argument that all males be required to own a gun. My point in the little exercise is to try and get you to think. You see, you may support an idea or belief, and support the idea that government be allowed to force people to comply with laws enacted to forward your agenda. Yet you would not like it were the government to use its power to force you to comply with laws you disagree with. I’m sorry, but that is a double standard, or as my friend calls it, intellectual dishonesty. If you truly believe that the government can require people to do one thing, then by the virtue of them having the ability to require that people do one thing, it can make them do ANYTHING. Anyway, this is what happens when I hear a snippet of a conversation, and then have a job that does not require me to think about what I’m doing. My mind is free to let that idea tumble around inside my head until it crystallizes into a train of thought that ends up becoming another article to entertain/enrage you. So my advice is to either remain quiet when I am within listening distance of your conversations, or be willing to open your mind to beliefs that may run contrary to yours. But please, whatever you do, don’t go off the handle when you hear someone say that they are a member of a militia. They are not a member of some radical extremist group which plans on overthrowing the government. They are more likely than not to be men who value their freedom and are willing to defend it from those that would take it from them. If that makes them enemies of the government you may want to ask yourself who your enemy really is. Is it the militia, or is it the government itself? If you are honest with yourself you may find yourself going out and buying a gun or two without me telling you to.